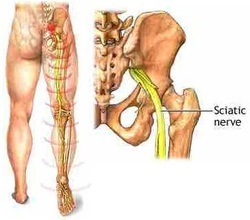 Sciatica is pain (burning, stinging, and numbing) resulting from irritation of the sciatic nerve. The pain of sciatica is typically felt from the lower back to posterior aspect of the thigh and radiating down below the knee. Sometimes you feel the pain in just one part of your leg and back and sometimes you feel pain in the entire leg. The sciatic nerve is the largest and longest nerve in the body and begins from nerve roots in the lumbar spinal cord (L4 to L5) in the lower back and extends through the buttock area to send nerve endings down to the lower limb, as far as the foot. Check the weaker side of the leg (put a finger under the toe, pull a leg and examine the stiffness of the posterior aspect of the leg to determine which leg is weaker or tighter.). Prone position --> We focus on trunk area (San-shoh-yu, Jin-yu, Dai-choh-yu, Boh-koh-yu and Shi-shitsu (These are called Tsubo in Japan that means a vital point.)). There are basically 3 lines. Also we work on sacral, iliac crest and gluteal regions. Then, we do the posterior aspect of the leg, especially, Shoh-fu, In-mon and Shoh-zan. When we press Shoh-fu, we grab the ankle and bend it toward the hip slowly from outside to inside. Now, supine position --> We work on the anterior aspect of the leg from inguinal to tarsal region. The main points are Yoh-ryoh-sen, San-ri, Ken-shoh and Kai-kei. The cupping pressure on the patella is very effective. 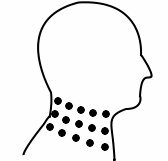 Lateral position --> There are 5 lines on cervical region from anterior to posterior. First, anterior cervical, then follow the edge of the collarbone. Second, in between anterior & lateral cervical. Third, lateral cervical, then follow the edge of the skull bone which starts from the back of the ear and ends medulla oblongata. Fourth, in between lateral & posterior cervical. Fifth, posterior cervical. Then, treat on around the shoulder. Supra scapular --> around supra scapular --> circling the shoulder --> Ken-guu (on the deltoid muscle) with thumb by thumb --> the edge of the deltoid muscle --> lateral brachial & ante brachial regions --> inter scapular (more like the edge of the shoulder blade) --> Ten-soh --> teres minor & major --> axillary region --> infra scapular region. There is a different way which depends on the case. Give the palm pressure from shoulder to arm including chest area. Then, anterior cervical --> collarbone (above & below) --> the 1st point of deltoid pectoral groove --> in between anterior & lateral cervical --> lateral cervical --> the edge of the scull bone --> in between lateral & posterior cervical --> Ten-chuu --> Ken-sei (supra scapular) --> inter scapular (around the shoulder blade too) --> teres minor & major and deltoid muscle. 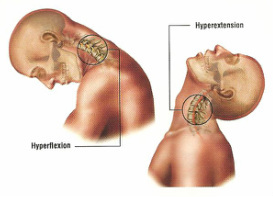 This is the cervical injury caused by the successive flexing and sudden and excessive stretching of the neck. This combination may cause a cervical sprain in the flexing stage and, above all, an injury in the facetary joint in the spine during the stretching phase. it is usually due to a car accident in which a frontal collision takes place. The frontal impact causes an excessive flexing of the neck followed immediately by its full extension provoked by the reactive force. Furthermore, all this takes place very quickly, not allowing time for the muscles to perform their protective role. Pain may become chronic. Check the client’s neck how much it is damaged --> We give the palm pressure on the head with both hands, the one to the back side of the head and the other to the fore head. It depends on the condition of the client. Sometime, we do this treatment on the chair. 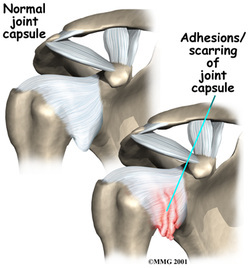 Inter scapular --> Press alternately left --> right --> left --> right by one hand each side. Then, follow the collarbone (above and below).